Because everyone wants more of it...the color experts at Zoya went back to the lab and created six more beautiful, long-wearing textured, matte and sparkling Zoya PixieDust Colors! Solange: EXCLUSIVE PIGMENT!!! Gold Metal sparkle, exclusive Zoya PixieDust Matte Sparkle formula. Beatrix: Tangerine Metal sparkle, exclusive Zoya PixieDust Matte Sparkle formula. Destiny: Coral Metal sparkle, exclusive Zoya PixieDust Matte Sparkle formula. Miranda: Rose sparkle, exclusive Zoya PixieDust Matte Sparkle formula. 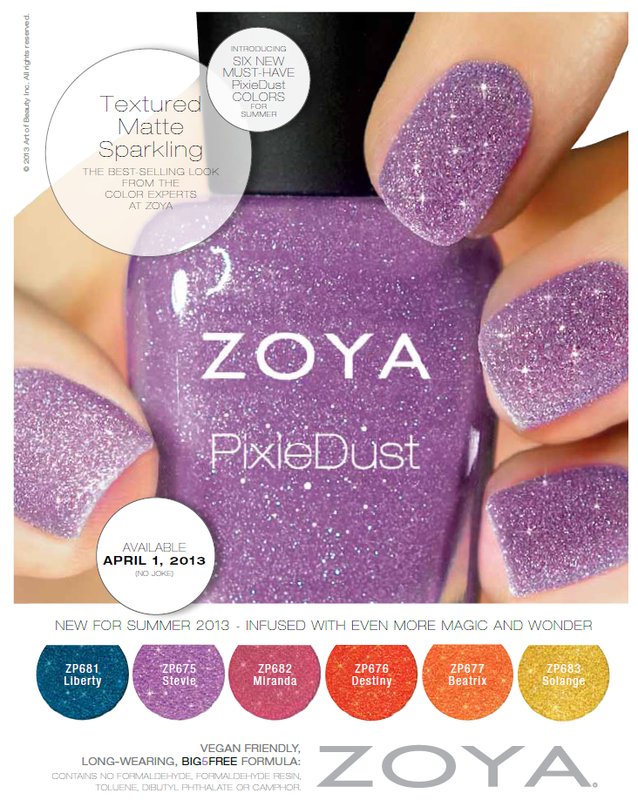 Stevie: Violet sparkle, exclusive Zoya PixieDust Matte Sparkle formula. Liberty: Blue sparkle, exclusive Zoya PixieDust Matte Sparkle formula. Ultra long-wearing, nail lacquers by Zoya are BIG5FREE - all formulas are completely free of harmful industrialchemicals such as toluene, camphor, formaldehyde, formaldehyde resin and dibutyl phthalate (DBP)that are known to cause cancer and birth defects. Find over 300 stunningZoya colors on www.zoya.com. Each and every color has a name as unique as the women who inspired it.